It’s no secret that we, at Modern Reston, love a beautiful glass of wine. We are always on the hunt for new local wineries. A place to hang out with friends away from the (sub)urban jungle we call home. Sadly, while most local wineries are scenic, we are usually disappointed with the actual wine — whites are sweet and cloying, reds are flaccid and thin. 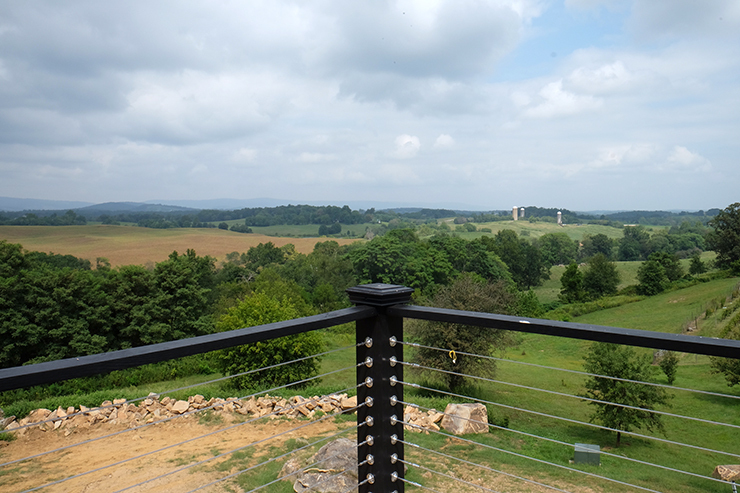 So when we set out to visit the new Blue Valley Winery & Vineyards in Delaplane, we had pretty low expectations. Much to our surprise, what we found while working through the tasting menu was an extremely consistent and high-quality catalog of wines. 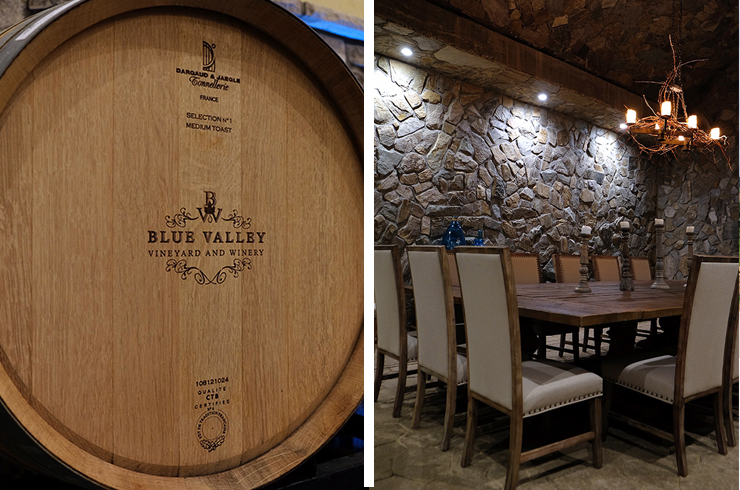 Blue Valley Winery & Vineyards, founded by the Greek Zissios family, produces wines in the Macedonian tradition — imbued with old-world style and three generations of wine-making experience. 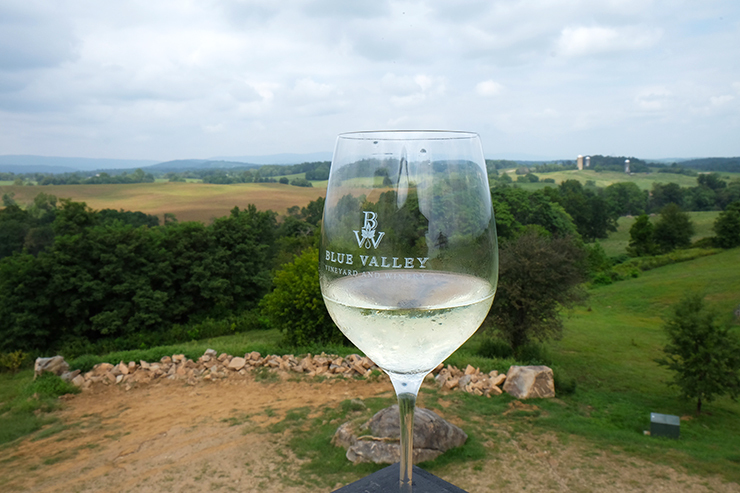 Open for almost a year, Blue Valley is the largest producer of wines in Fauquier Country. 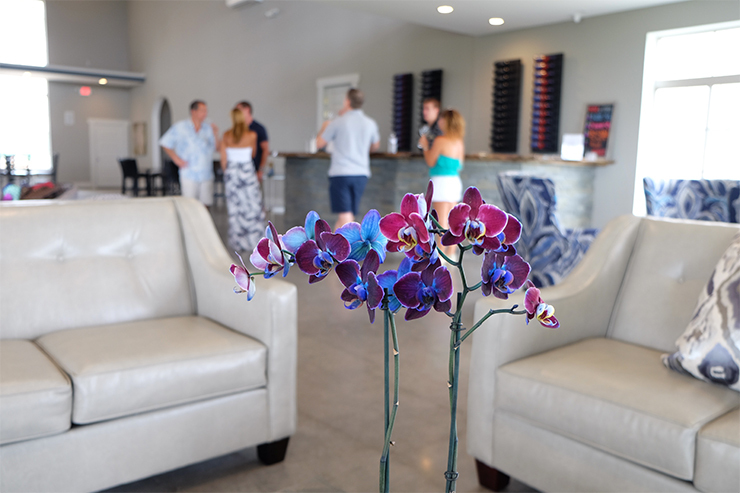 It’s a sprawling 63 acre property with an impressive 20,000 square foot tasting room. The Zissios family has planted over 17,000 vines consisting of Petit Verdot, Cabernet Sauvignon, Cabernet Franc, Chambourcin, Viognier, Chardonnay, Sauvignon Blanc and Muscat Ottonel, Merlot and Zinfandel. Because this is a young vineyard, Blue Valley also uses grapes from California to supplement their production. As they mature, the winery will slowly shift over to using a majority of local grapes. It will be interesting to see how the wines change and evolve with grapes grown in a more humid climate. Blue Valley has an extensive wine list. The day we were there, we tried three rosés, five whites and three reds. Surprisingly, each rosé had it’s own unique characteristics and the whites (Sauvignon Blanc, Pinot Gris, Viognier, and a blend) were dry, crisp and fruit-forward. The Chardonnay is the only barrel fermented white and is more complex but still manages to avoid being heavy. Father and son duo, John and Stergio, believe that wines should be dry and have close to no residual sugar (natural grape sugars leftover after fermentation ceases). This means that all of their wines are carefully monitored to make sure that the yeast doesn’t die off during fermentation before gobbling up all the sugar. This is what sets Blue Valley’s wines apart from most Virginia wines and what made our group infinitely happy! 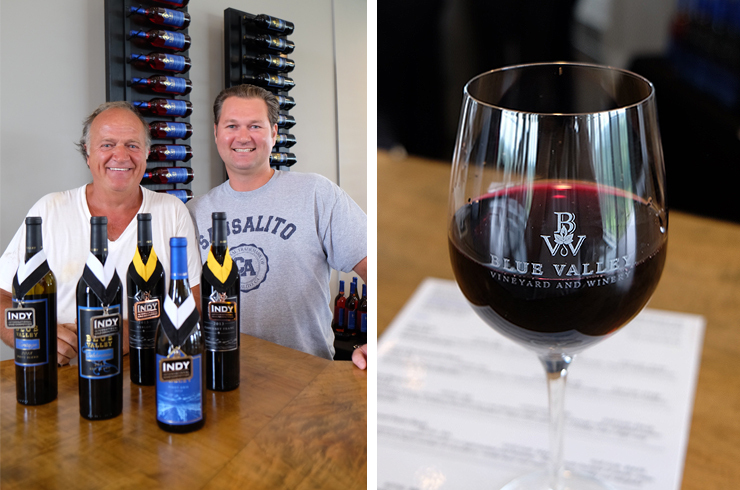 All three of Blue Valley’s reds took home medals in this year’s INDY International Wine Competition. Out of 2,000 entries, their Celebration Blend took home silver and their Cabernet Franc and Merlot each won bronze. Blue Valley has two patios, one is under construction and the other was in full-swing while we were there. You can enjoy live music, and assortment of cheeses, hummus and breads, plus spectacular views of the valley. The whole Blue Valley operation is closer to a winery you would find in California than in Virginia. Adjacent to the barrel room is a cozy and cool (as in temperature cool) wine cave that is perfect for intimate dinner parties and celebrations. But aside from its soaring ceilings and gorgeous vistas, the Zissios family is concerned primarily with their product. 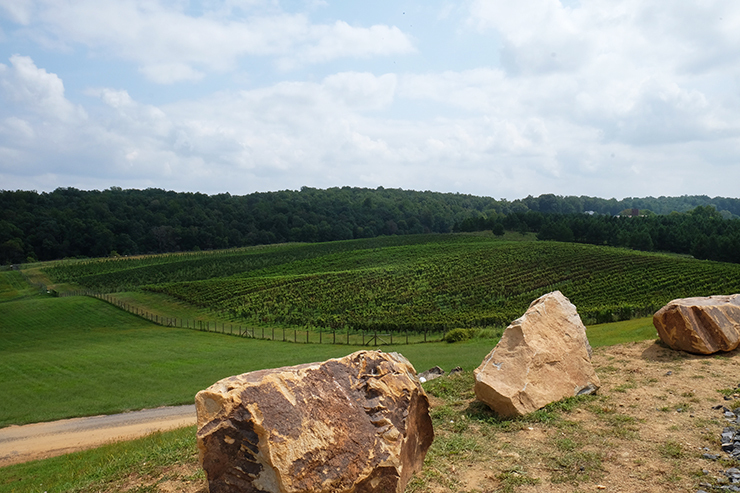 They are passionate about producing the highest quality wines and elevating Virginia winemaking to that of the rest of the world. I, personally, am concerned with drinking the best tasting wines I can find, and these are the best I have yet to taste in NoVa.